Widespread and locally common. The first of the large dragonflies to emerge each year. Adults can be seen from early May to mid July. 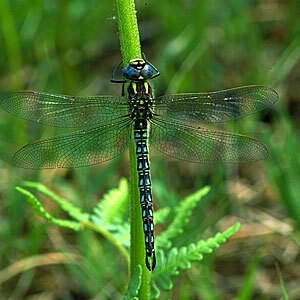 The Hairy Dragonfly can be found at sheltered lowland lakes, fens and cutover bogs. It is locally common in parts of the midlands, north and west. This is the earliest dragonfly to emerge each year. Adults have been seen regularly in early May and may even emerge earlier in favoured years. Unlikely to be confused with other hawker dragonflies due to its early flight period in May/June. Adults are smaller and darker than the Common Hawker Aeshna juncea which is the most similar Irish species.